Seals have been used throughout history to show personal imprints that act as markings of authenticity and binding agreements and edicts. 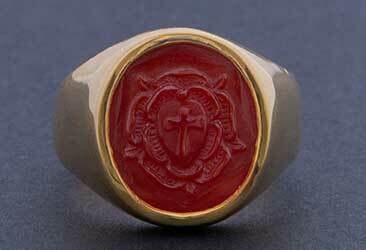 In the past signet rings were worn by Kings, Popes, Bishops and Roman Emperors. Other high ranking church officials and noblemen also use them as a sign of their nobility, importance and power. Probably the most famous religious signet ring in the world, today, is worn by the Pope. His ‘Sacred Seal’ ring is called the “Fisherman’s Ring”, a massive and ornate gold seal ring, which denotes the seal of his authority. When the Pope dies, the Cardinals break his ring. 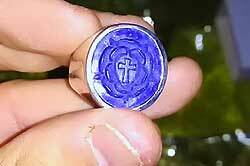 A new signet ring is created for each new succeeding Pope. A related practice is found among blacksmiths: their touchmark (a stamp used on the hot metal to show who made it) is destroyed upon their death. Although rarely used today for impressing wax onto a document, Seals are still very popular. Engraved seal rings and signet rings, are worn by family members wishing to proudly wear their heritage and family history. Engraved with your crest or coat of arms, a custom engraved signet ring, meticulously sculpted or carved by our skilled craftsmen, is an iconic piece of jewellery that will immortalize your family’s cherished history. A signet ring has always distinguished an individual as one of high social standing, a privilege, a military distinction and a rich ornament. The seal marks the dignity and importance of its wearer. This provides a visual and symbolic “certification” which validates acts executed in their name. In other words they provided a visual “Plumbline of Authenticity” proving that the wearer was not only truly who he said he was, but they symbolized his power in the community. 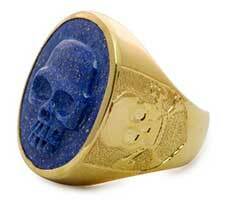 The theft of a signet ring was punishable by death. 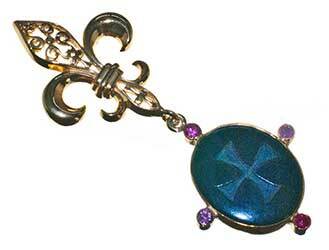 Originally they were only worn by royalty, religious officials and noblemen. 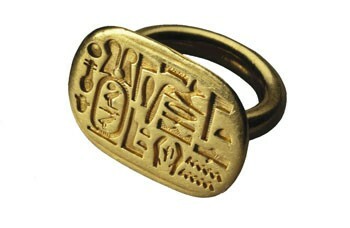 As time passed, tradesmen and merchants also began wearing these rings. 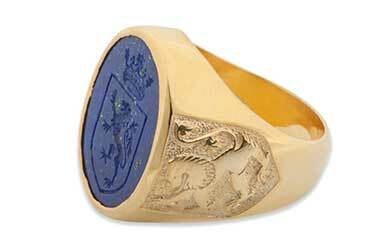 Royal signet rings were lavishly decorated with precious metals, rich enamels and gems of every color and facet. 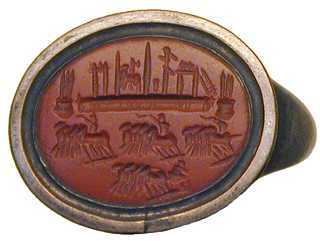 Tradesmen and merchants’ signet rings had mottos or logos cut into them. Seals were used in the earliest civilizations. In ancient Mesopotamia seals were engraved on cylinders. They could be rolled to create an impression on clay, such as a label on a consignment of trade goods. From Ancient Egypt seals in the form of signet-rings of kings have been found. From the beginning of the 3rd millennium BC until the Dark Ages, seals of various kinds were in production in the Aegean islands and mainland Greece. The Late Bronze Age is the time par excellence of the lens-shaped seal and the seal ring, which continued in to the Archaic, Classical and Hellenistic periods, in the form of pictorial engraved gems. Engraved gems continued to be produced and collected until the 19th century. During the early Middle Ages seals of lead were in common use both in East and West, but these leaden authentications soon went out of favour in western Christendom and it became the universal practice to take the impressions in wax. The signet is a small seal dating from the reign of Edward II (1307-27) until 1851. Every warrant of the privy seal or great seal required a seal. Ever since the middle ages those entitled with a grant to bear heraldic arms used signets. A seal authorized orders or letters to authenticate the bearer. 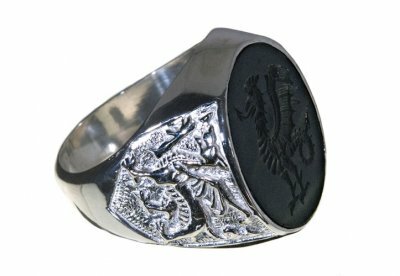 This is therefore why this genre of Jewellery Men rings are respectfully labelled Heraldic Rings. Signets and Seals were the distinguishing mark of legal stamping and authentication for 600 years. Businesses, lawyers and government therefore used them. Their presence is also felt today even in common parlance. “set one’s seal on” meaning to authorize or give one’s approval to something. “signed sealed and delivered” – this idiom additionally referring to a legal deed. Gold signet rings became increasingly popular from the 17th century onward as the ultimate, portable mark of distinction. 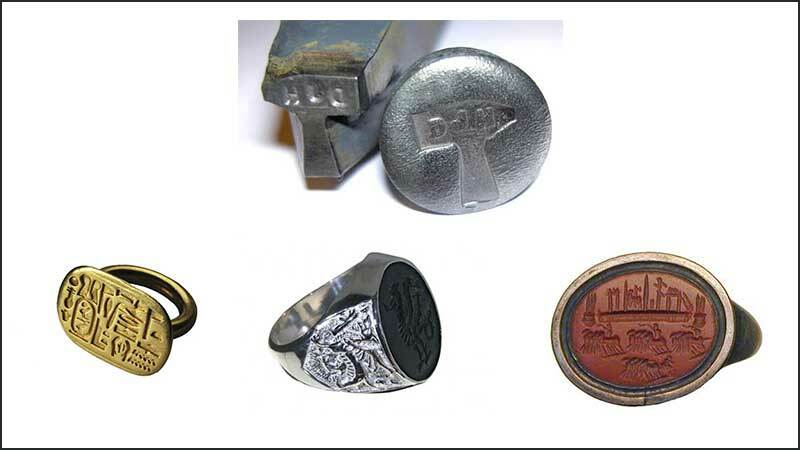 By the 18th century the signet ring (or fob signet for ladies) was also more widely used to seal letters. They also included those of a more lighthearted or personal nature . 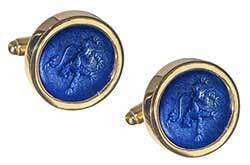 Seals and Signets became more elaborate with the introduction of gemstones set in Gold. Engraving consequently became more precise and artistically challenging to cope with the much harder materials. Seal engraving became a true art form in its own right and remains no less so today. You will find exquisite creations in The Regnas Collection today. Most classical engraved gemstone rings were originally worn as signet rings. This inspired the wide spectrum of gemstones used today. They include Lapis Lazuli, Rock Crystal, Amethyst, Red Agate, Jade Albite, Rhodonite, Jade, Bloodstone and Black Onyx, among others. 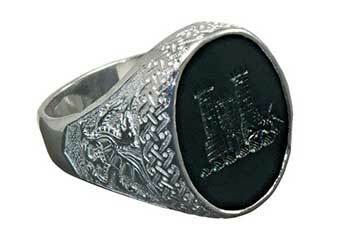 Signet rings are also used as a souvenir or membership attribute, such as a class ring ( which typically bears the coat of arms or crest of the school). The Masonic ring is an especially relevant example of this. 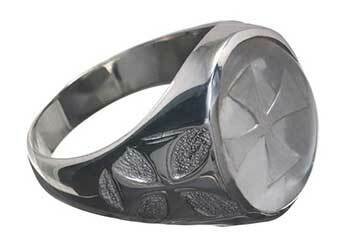 You can consequently find many such designs in the The Regnas Collection Heraldic Rings section. Pompey: (106-48 B.C.) Pompey’s signet ring displayed a lion bearing a sword. This Roman politician, Gnaeus Pompeis Magnus, better known as Pompey, was one of the greatest generals of his time. Julius Caesar: (circa July 12/13, 102/100 B.C. – March 15, 44 B.C. ): His ring had an armed Venus. Caesar Augustus: (63 B.C. – 14 C.E.) His signet ring had first a sphinx, then the head of Alexander the Great. 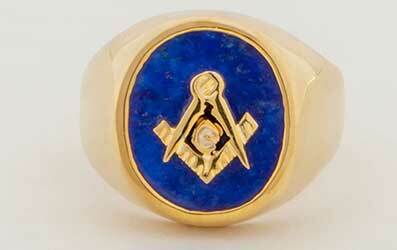 Finally he placed his own image on his signet ring. Rome achieved great glory under Emperor Octavian/Augustus. Nero (37 AD – 68 AD) was the 5th and last of the Julio/Claudian dynasty of Roman Emperors. His reputation is as an ineffectual, neglectful and brutal leader. His signet ring represented the flaying of Marsyas by Apollo.